The Center also features a variety of Ivalo and Ketra high-performance LED fixtures, which, according to Blair, will be the next business expansion opportunity for dealers. “Dealers wanting to explore LED fixtures as a business expansion opportunity will have plenty of chances to do so in the new space,” he said. “Here, Lutron customers can witness the powerful performance of LED fixtures, drivers, and control solutions from our Ivalo Collection – and as a result of our recent acquisition – from Ketra.” Blair said Lutron wants to help facilitate the conversation between the dealer, client and specifier to ensure fixtures are being considered earlier in the design process and from a controls compatibility standpoint. Lutron opened its first Experience Center in Plantation, Fla. in 2001. The company has since added facilities in Coopersburg, Penn., Irvine, Calif., New York City, Washington, D.C., Toronto and London. 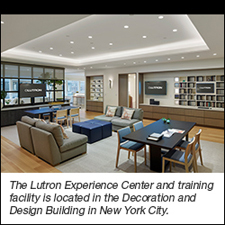 Located at 979 Third Avenue, Suite 319, in New York City, the new Lutron Experience Center is open Monday-Friday, 9am-5pm with private tours available for your most distinguished clients. Appointments are preferred, but walk-ins are always welcome. To schedule a visit, please call your local Lutron representative or call (212) 752-1214.